Our latest publication is Imeall: A computational framework for the calculation of the atomistic properties of grain boundaries (H. Lambert, A. Fekete, J.R. Kermode, and A. De Vita, Computer Physics Communications (2018), In Press). 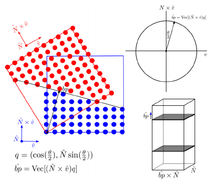 The paper describes the Imeall package for the calculation and indexing of atomistic properties of grain boundaries in materials. The package provides a structured database for the storage of atomistic structures and their associated properties, equipped with a programmable application interface to interatomic potential calculators. The database adopts a general indexing system that allows storing arbitrary grain boundary structures for any crystalline material. The usefulness of the Imeall package is demonstrated by computing, storing, and analysing relaxed grain boundary structures for a dense range of low index orientation axis symmetric tilt and twist boundaries in α-iron for various interatomic potentials. The package’s capabilities are further demonstrated by carrying out automated structure generation, dislocation analysis, interstitial site detection, and impurity segregation energies across the grain boundary range. All computed atomistic properties are exposed via a web framework, providing open access to the grain boundary repository and the analytic tools suite. Fig. 1. The general coordinate system for determining tilt and twist boundary planes and orientations using quaternion algebra. Please see https://www.nomad-coe.eu/the-project/outreach/outreach-publications for open access versions of our publications which can be accessed from the PDF links.